This post is a followup. One weekend after the installation of the washer-dryer was complete, the floor was back together and the complicated door was in place. The front from the old chart drawer that had to be removed was used to cover up the hole. Most importantly the unit was working with sudsy water pouring into the lake and the dryer working really well. The old unit blew lint all over the side of the boat. The new unit has a really good filter. The new unit is quieter as well. 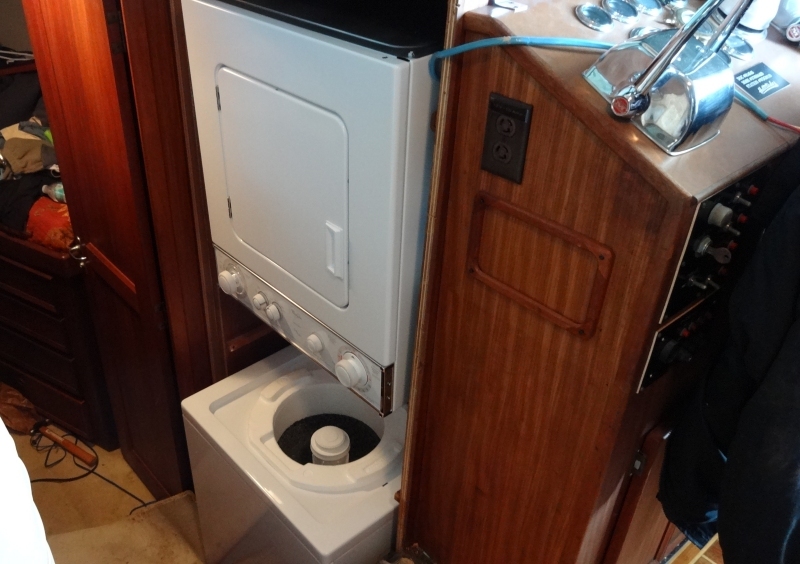 If you are going to live aboard then a washer-dryer really adds to your quality of life. If the unit on your new to you boat is 30 years old, replace it before you take off. There is a lot of new technology in todays washer-dryers. If possible get a two piece unit rather than the one piece units which don't dry very well. Hattitude left for Aqua Yacht Harbor last Monday with no firm plan as to where to go after that. There will be clean clothes, towels and sheets for the crew.